A slightly revised version for the book cover for the Geographic Visualization book. You can pre-order it on Amazon. 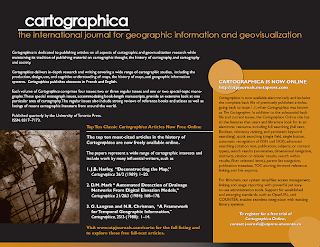 Promotional flyer for the journal Cartographica. "Geography is the study of where things are, what they're doing there and why they aren't somewhere else. In the old days, it used to be the study of places and maps. This is now seen as an outdated approach, and to suggest that a certain place might actually be somewhere else is bordering on cultural imperialism." Hello, I am serving on the editorial board for Cartographica and thought I would pass this on. The top ten most-cited articles in the history of Cartographica are now freely available online at http://utpjournals.metapress.com/content/120327/. Also available by subscription is the complete back file of articles going back to issue 1:1, when Cartographica was known as The Cartographer. The papers represent a wide range of cartographic interests, and include work by many influential writers. The most-cited article is a well known piece by Brian Harley, often credited with changing the way we think about maps. Harley also has an entry at the number 8 position on maps and ethics. Other notable authors include Mark Monmonier in a piece which helped establish the analysis of interactive and animated mapping, and G. Langran and Nik Chrisman’s article on temporal data. Several authors including Mark Kumler and James Carter focus on the representation of elevation data, presciently foreshadowing today’s interest in virtual globes and terrain representation. The deep ties between cartography and GIS are also clear in work by David Mark and Donna Peuquet. The listing was created using Elsevier’s Scopus database, and is current as of December 2007. 1. Harley, J.B. 1989. Deconstructing the Map. Cartographica 26(2), pp. 1-20. 2. Mark, D.M. 1984. Automated Detection of Drainage Networks From Digital Elevation Models. Cartographica 21 (2-3), pp. 168-178. 3. Langran, G., and Chrisman, N.R. 1988. A Framework for Temporal Geographic Information. Cartographica, 25(3), pp. 1-14. 4. Peuquet, D.J. 1984. A Conceptual Framework and Comparison of Spatial Data Models. Cartographica, 21(4), pp. 66-113. 5. Mark, D.M. and Csillag, F. 1989. The Nature of Boundaries on “Area Class” Maps. Cartographica, 26(1), pp. 65-78. 6. Monmonier, M. 1990. Strategies for the Visualization of Geographic Time-Series Data. Cartographica, 27(1), pp. 30-45. 7. Blakemore, M. 1984. Generalization and Error in Spatial Data Bases. Cartographica, 21 (2-3), pp. 131-139. 8. Harley, J.B. 1990. 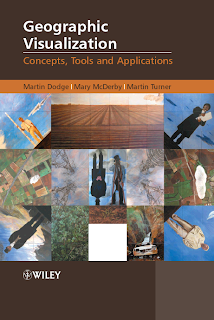 Cartography, Ethics and Social Theory. Cartographica, 27(2), pp. 1-23. 9. Carter, J.R. 1992. The Effect of Spatial Precision on the Calculation of Slope and Aspect Using Gridded DEMs. Cartographica, 29(1), pp. 22-34. 10. Kumler, M.P. 1994. An Intensive Comparison of Triangulated Irregular Networks (TINs) and Digital Elevation Models (DEMs). Cartographica, 31(2), pp. 1-99.